What Is Different About A 4 Season Tent? A 4 season tent is just like it sounds – a tent that is designed to be used winter, spring, summer and fall. More specifically though, they are built to withstand harsh winter conditions. Their heavy duty design allows them to be sturdier and more durable than their 3 season tent counterparts. Heavier and more durable poles to withstand additional weight that might come from snow or ice or the beating that can come from strong wind. More poles in the design for additional roof support and better distribution of weight to prevent sagging from the build up of snow. Tighter construction designed to retain body heat within the tent and keep the elements out. Thicker, more rugged fabric to protect from the elements and retain body heat. More space to accommodate the greater amount of gear usually associated with winter backpacking. In the past, these tents were only for serious backpackers who routinely went out in more extreme conditions. The average backpacker usually avoided them due to their extra weight and size. Furthermore, even though these tents are rated as four seasons, due to the materials used in their construction they could make a poor choice for warm weather backpacking due to poor ventilation. However, manufacturers are able to provide very versatile tents that are not nearly as heavy as previous versions and convert nicely into tents that can be used comfortably in warm weather. These convertible tents usually cost more due to the more advanced materials used to make them light yet still durable. Additionally, it should be noted these tents are not the best choice for ultralight backpackers as it is hard to find a tent under four pounds. 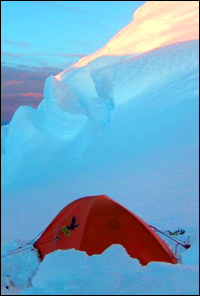 If you’re interested in lightweight tents, visit our ultralight tent page. Also, expect to pay $400-$500 for most 4 season tents.